Is your casual Friday wardrobe in need of a refresh in 2019? We have just the thing—a new teacher T-shirt! 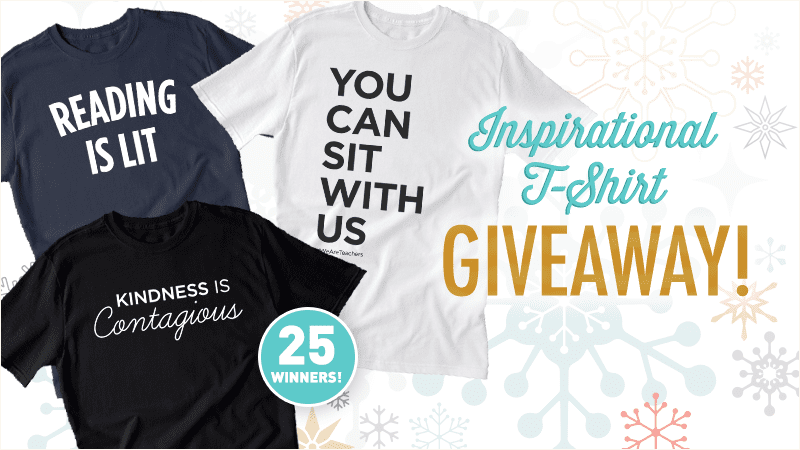 We’re giving away inspirational and funny T-shirts that celebrate life as a teacher to 25 lucky winners. If you’re chosen, you’ll get to pick your favorite from our three best-selling T-shirts for teachers. You’ll even get to choose the color! Want more? Check out all of our teacher T-shirts here. All entries must be submitted using the online form by 11:59 p.m. Central Time on December 31, 2016. Winners will be selected by random drawing and announced on the WeAreTeachers website by January 5, 2017. Prizing: Twenty-five (25) winners will each receive one (1) t-shirt of their choice from the WeAreTeachers offered, Kindness is Contagious, Reading is Lit or You Can Sit With Us. Prize value is $21.99.